Israel widened its offensive on Lebanon Friday, with fighter bombers blasting the Beirut airport for a second day, in addition to bombing residential buildings in the southern suburbs of the capital, fuel storage tanks at a power plant, and the main highway to Syria. Police say three people were killed and 55 others were wounded by Friday's airstrikes. Wednesday and Thursday, 45 Lebanese and two Kuwaitis were killed, and 103 others were wounded in Lebanon. On the Israeli side, two civilians and eight soldiers were killed. Beirut airport officials say one of their three runways was hit by an Israeli missile in Friday's assault. Hezbollah's al-Manar TV and other local stations said the jets had badly damaged two bridges and a road intersection in nearby Ghobeiri. Other news reports said a playground where Hezbollah leaders hold rallies was also targeted. Hezbollah TV said several people were injured. Israeli officials had warned that south Beirut, a densely populated Shiite neighborhood where Hezbollah has its political headquarters, could be targeted. Leaflets dropped in the evening told people to stay away from Hezbollah offices. At least one Katyusha rocket fired by Lebanese guerillas hit Haifa, Israel's third largest city, 18 miles from the border, causing no injuries, Israeli authorities said. The Israeli ambassador to the United States, Daniel Ayalon, called the attack "a major, major escalation." Hezbollah — which had threatened earlier to target Haifa — denies launching the attack. Four dozen civilians have died in the violence following Hezbollah's capture of two Israeli soldiers. Israel holds Lebanon responsible for Hezbollah's snatching of the two soldiers, Ehud Goldwasser, 31, and Eldad Regev, 26. The Lebanese government insists it had no prior knowledge of the move and did not condone it — and even withdrew its ambassador to the U.S. after he made comments seemingly in support of the guerrillas. Hezbollah leader Sheik Hassan Nasrallah has his office and residence in the district of Haret Hreik in south Beirut. Hezbollah's Shura Council, its decision-making body, and the TV station are also located in that area, a section heavily guarded by Hezbollah. The targeted area lies between the Lebanese capital and the international airport, which was twice hit by Israeli warplanes on Thursday. One Israeli plane fired a missile at a fuel storage tank for the power station at Jiye on the Mediterranean coast in central Lebanon, just north of the port city of Sidon, witnesses said. 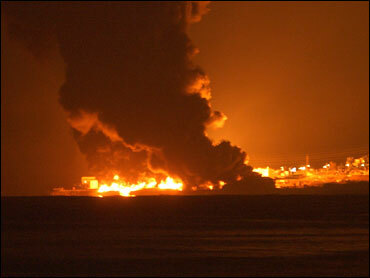 The attack started a fire in the area, about 20 miles south of Beirut, but the power station itself was not hit. U.S. Secretary of State Condoleezza Rice, telling reporters that it is important for Israel to exercise restraint, demanded that Syria pressure Hezbollah to stop the attacks on Israel. Israel believes it is already exercising restraint. "Despite the dramatic pictures we are seeing on our television screens, the Israeli command insists it is not going full throttle in Lebanon and does not intend to," reports CBS News 60 Minutes correspondent Bob Simon. "The objective, Israeli officers say, is to weaken Hezbollah on the ground in south Lebanon, and to pave the way for the government in Beirut to send the Lebanese army down to take its place." "Some of the pictures we do see," Simon continues, "illustrate the Israeli strategy - the bombing of the Beirut airport, the destruction of bridges. The Israelis want to cut off the supply routes to Syria. There is no Ho Chi Minh trail [the key supply route for enemy fighters in the Vietnam War] in this part of the world and if the air routes and the roads are closed, the Israelis say they will be able to isolate Hezbollah and destroy as many rocket launchers, garrisons and fighting units as possible." The Israeli command is speaking of an operation that will last somewhere between one and two weeks. "The government of Lebanon, the United Nations and other powers may call for a ceasefire but the Israelis will not accept a ceasefire, officers say, until it has achieved its military objectives," Simon adds. "The Israelis say they hope that they will be able to do this without calling up the reserves and without a major incursion into Lebanon by ground forces." Israel has hit hundreds of targets in Lebanon, including airports, and army bases to put pressure on the government and force Hezbollah to free two Israeli soldiers the guerrillas captured Wednesday. The main highway linking Beirut to the Syrian capital has been damaged, further tightening the Israeli blockade on Lebanon. The Lebanese government, caught in the middle, pleaded for a ceasefire. But Israel says it is determined to beat Hezbollah back and deny the group's fighters positions they traditionally held along the northern border. "If the government of Lebanon fails to deploy its forces, as is expected of a sovereign government, we shall not allow Hezbollah forces to remain any further on the borders of the state of Israel," Israeli Defense Minister Amir Peretz said. Israel's offensive - its heaviest in Lebanon in 24 years - was launched after Hezbollah guerrillas snatched two Israeli soldiers in a brazen cross-border raid Wednesday. Two days of Israeli bombings killed 45 Lebanese and two Kuwaitis and wounded 103. Two Israeli civilians and eight Israeli soldiers have also been killed, the military's highest death toll in four years. Israel said its attacks are intended to prevent the movement of the captured soldiers and hamper Hezbollah's military capacity, reports CBS News chief foreign correspondent Lara Logan. The army told Logan that it believes the two abducted soldiers are still alive and they are afraid the captives will be moved to Iran. With the airport closed, many tourists were trapped while others drove over the mountains to Syria. The State Department says that about 25,000 Americans live in Lebanon. If the conflict gets worse, the U.S. government has a responsibility to evacuate those who want to leave, which might mean sending in the Marines, reports CBS News correspondent David Martin. Now that the airport has been bombed, the options for evacuating Americans are a lot more complicated. Marines would have to fly helicopters from Cyprus to Lebanon, or from amphibious ships in nearby waters. Fears mounted among Arab and European governments that violence in Lebanon could spiral out of control in a volatile region already torn by conflicts in Iraq and in Gaza. Israel launched an offensive in Gaza against Hamas, whose fighters are holding another Israeli soldier captured two weeks ago. The shockwaves from the fighting on two fronts began to be felt as oil prices surged Thursday to a record above $78 a barrel in world markets, also agitated by the threat of supply disruptions in the Middle East and beyond. Thursday, after Israeli Army chief Brig. Gen. Dan Halutz warned that "nothing is safe" in Lebanon, President Bush backed Israel's right to defend itself and denounced Hezbollah as "a group of terrorists who want to stop the advance of peace." But he also expressed worries the Israeli assault could cause the fall of Lebanon's anti-Syrian government. "We're concerned about the fragile democracy in Lebanon," Mr. Bush said in Germany. Later, a Lebanese government statement said Mr. Bush has promised Lebanese Prime Minister Fuad Saniora that he will press Israel to halt its attacks on Lebanon. A statement from Saniora's office said that Mr. Bush phoned Saniora at midday Friday to discuss the deteriorating situation in Lebanon. Saniora asked Mr. Bush to push Israel to halt its airstrikes on Lebanese infrastructure. "President Bush affirmed his readiness to put pressure on Israel to limit the damage to Lebanon as a result of the current military action, and to spare civilians from harm," the statement said. The European Union took a harsher tone, criticizing Israel for using what it called "disproportionate" force. EU foreign policy chief Javier Solana said he is planning a peace mission. Thursday, the United States cast the first U.N. Security Council veto in nearly two years, blocking an Arab-backed resolution that would have demanded Israel halt its military offensive in the Gaza Strip. The Arab League called an emergency meeting of foreign ministers in Cairo on Saturday, and Palestinian President Mahmoud Abbas warned that Israel's Lebanon offensive "is raising our fears of a new regional war." Egypt launched a diplomatic bid to resolve the crisis, amid apparent frustration among moderate Arab nations that Hezbollah — and by implication its top ally Syria — had started the fight with Israel. The last time Israeli strikes targeted Beirut was in 2000, when warplanes hit a power station in the hills above the city after a Hezbollah attack killed Israeli soldiers. Israel has not hit Beirut's airport since its 1982 invasion of Lebanon and occupation of the capital.